Perichoresis (from Greek: περιχώρησις perikhōrēsis, "rotation") is a term referring to the relationship of the three persons of the triune God (Father, Son, and Holy Spirit) to one another. Circumincession (later circuminsession) is a Latin-derived term for the same concept. It was first used as a term in Christian theology, by the Church Fathers. The noun first appears in the writings of Maximus Confessor (d. 662) but the related verb perichoreo is found earlier in Gregory of Nazianzus (d. 389/90). Gregory used it to describe the relationship between the divine and human natures of Christ as did John of Damascus (d. 749), who also extended it to the "interpenetration" of the three persons of the Trinity, and it became a technical term for the latter. It has been given recent currency by such contemporary writers as Jürgen Moltmann, Miroslav Volf, John Zizioulas and C. Baxter Kruger, and others. Modern authors extend the original usage as an analogy to cover other interpersonal relationships. The term "co(-)inherence" is sometimes used as a synonym. Since humans are made in the image of God, a Christian understanding of an adequate anthropology of humans' social relations is informed by the divine attributes, what can be known of God's activity and God's presence in human affairs. Theologians of the Communio school such as Hans Urs von Balthasar, Henri de Lubac and Joseph Ratzinger locate the reciprocal dynamism between God and God's creatures in the liturgical action of sacrament, celebrating the sacred mysteries in Eucharistic communion, in a hermeneutic of continuity and apostolic unity. "Perichoresis" is derived from the Greek peri, "around" and chorein, which has multiple meanings among them being "to make room for", "go forward" and "contain". Circumincession from the Latin circum, "around" and incedere meaning "to go, to step, approach", the Latin translation being first made by Burgundio of Pisa (d. 1194). The form "Circuminsessio" developed from the similarity in sound. The relationship of the Triune God is intensified by the relationship of perichoresis. This indwelling expresses and realizes fellowship between the Father and the Son. It is intimacy. Jesus compares the oneness of this indwelling to the oneness of the fellowship of his church from this indwelling. "That they all may be one; as thou, Father, art in me, and I in thee, that they also may be one in us" (John 17:21). The great 12th century Cistercian reformer St. Bernard of Clairvaux spoke of the Holy Spirit as the kiss of God, the Holy Spirit being thus not generated but proceeding from the love of the Father and the Son through an act of their unified will. Together, they breathe forth the Holy Spirit. In John 15:26, Jesus says, “But when the Counselor comes, whom I shall send to you from the Father, even the Spirit of truth, who proceeds from the Father, he will bear witness to me.” Earlier, in the first millennium, theological tradition had viewed the indwelling as fellowship. John of Damascus, who was influential in developing the doctrine of the perichoresis, described it as a "cleaving together." Such is the fellowship in the Godhead that the Father and the Son not only embrace each other, but they also enter into each other, permeate each other, and dwell in each other. One in being, they are also always one in the intimacy of their friendship. The devotion of themselves to each other in the Spirit by the Father and the Son has content. Not only does the procession of the Spirit from the Father to the Son and from the Son to the Father express their mutual love, as they breathe after each other, but also it gives each to the other. In the procession of the Spirit from the Father, the Father gives himself to the Son; in the procession of the Spirit from the Son to the Father, and in this use of the word "procession" from the Son is meant the sending of the Holy Spirit as the Son teaches that the Holy Spirit proceeds from the Father, the Son gives himself to the Father in prayer, for the procession of the Spirit, like the begetting of the Son, is the going forth of the being of the Father to the Son and the going forth of the being of the Son to the Father as the Holy Spirit. 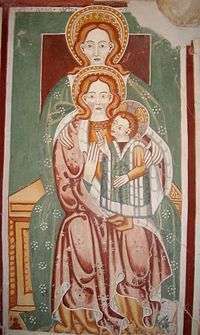 A trinitarian action of grace is implied in sacred art of the type Anna selbdritt: creator Father, redeemer Son, reflexive procession of the Holy Spirit, with the divine Christ-child pointing back at his human mother and grandmother. The property of divine grace in the Trinitarian mission is distinct for each person or hypostase of the Holy Trinity yet united, communing, indwelling, in Trinitarian love. All is God's gift from the Father, through the Son's Incarnation and in the gift of the Holy Spirit. This relational co-inherence is often represented as Borromean rings or the Scutum Fidei. 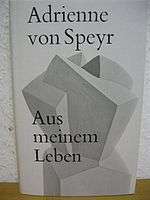 The tombstone of the twentieth-century Swiss mystic and Catholic convert Dr. Adrienne von Speyr features a three-dimensional monolithic stone carving resembling the bas-relief two-dimensional carved eternal-knot symbol of Norse mythology, the valknut, used to eulogize legendary valor surpassing human understanding. 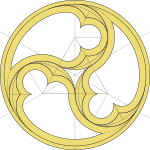 The mysterious beauty of three-fold symmetry is evident in even more ancient forms of the Triskelion such as the spining three-legged flag of Sicily with its pre-Byzantine roots in Greek culture and the carved lozenge near the main entrance of the prehistoric Newgrange monument in County Meath, Ireland, with its characteristic iron-age Celtic swirl using the spatial-motion symmetry of an Archimedean spiral from around 3200 BCE. The Cappadocian Fathers described the Trinity as three individualities in one indivisible being, asserting that Christian community is an analogy: that the social Trinity is—in Eastern Orthodox terminology—an "icon" or sign of God's love. Such a conception refutes the adoptionism which some attribute to the Anomoeans (an "Arian" sect) and other anti-trinitarians, which reduce the conception of the unity of God in Christ to a purely ethical concept, strictly comparable to a human relationship between two (or three) individuals. In contrast, the basis for human relationship pointed to by the Cappadocian Fathers is within God as such, not in God in relation to another that is not God. 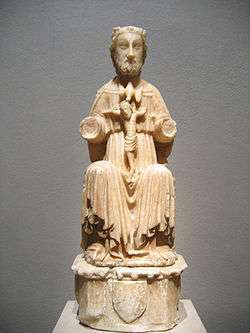 The relationship between the Father, Son and Holy Spirit was not explicitly expressed in the writings of Ante-Nicene Fathers exactly as it would later be defined during the First Council of Nicaea (325) and the First Council of Constantinople (381), namely as one substance (ousia) and three persons (hypostaseis). A hermeneutic of the one-in-three principle slowly approached the synthesis understood today as perichoresis. "The crucial point, in a word, is that the relation to God, and to others in God, that establishes the individual substance in being is generous. The relation itself makes and lets me in my substantial being be. This “letting be” implies a kind of primordial, ontological “circumincession,” or “perichoresis,” of giving and receiving between the other and myself. What I am in my original constitution as a person has always already been given to me by God and received by me in and as my response to God’s gift to me of myself ― indeed, has also, in some significant sense, been given to me by other creatures and received by me in and as my response to their gift to me." Pope John Paul II taught a series of catecheses on the mystery of the indwelling of the Holy Spirit in the sacramental life of the faithful Christian. The anthropological aspects of the agency of the human heart—its capacity for the gift of love and to give love in return—lived out in moral acts of social justice has since become known as his Theology of the Body. Seen more specifically as a development in perennial wisdom of Church dogma, the Natural Law, the indwelling of God in the human heart is, as taught by St. Augustine a gift of grace, perfecting nature. This philosophical approach to a deeper theological truth of the human person's need for God was developed into a systematic metaphysics by St. Thomas Aquinas, Man as the image of God. Interpretations of the incarnational mystery of the perpetual virginity of the Mother of God were frequently executed by artisans in relational form, most recognisably as Madonna, some works depicting three generations as in Metterza. The mutual reciprocity contained in a personalist phenomological approach to the philosophy of being draws attention to man's need for transcendence, that a duality between good and evil is not sufficient to explain the mystery of human social relations in community. John Henry Newman popularised the Latin aphorism "cor ad cor loquitur" or heart speaks unto heart (first coined two centuries prior by the Doctor of the Church Frances de Sales "cor cordi loquitur") to describe adequately communicating the graced intimacy of man's conformity to Jesus's loving obedience to his Father's divine will unto death. St. Augustine had grasped this profound truth a millennia prior, "Sonus verborum nostrorum aures percutit; magister intus est." that when a teacher speaks worthily of divine things, as the sound of the words strike our ears, it is no longer mere words but God himself who enters. "... these analyses implicitly presuppose the reality of the Absolute Being"
"Were this... to be taken to extremes, the essence of Christianity would be detached from the vital relations fundamental to human existence, and would become a world apart, admirable perhaps, but decisively cut off from the complex fabric of human life." The cosmological aspect of human's transcendent destiny is personified in the bodily assumption of the Virgin Mary into heaven. Human's insufficiency in and of the human self to attain transcendence was dramatized by the later Pope John Paul II in his short play "Radiation of Fatherhood". The dialog centers on a driven male protagonist being challenged in his assumptions by a mysterious female interlocutor. The natural physical drive of masculinity seeking penetrating insight encounters and is drawn in by the receptivity and responsiveness of the feminine characters in successive encounters that reveal the unmet and unaddressed needs hidden within his heart. The radiation of the work's title refers to action of the Holy Spirit in the sphere of human affairs, that the temporal bonds between two contracting parties fall short of human's desire for permanence, an eternal covenant of love found in the abiding indwelling of a communio personarum formed in the image of God, the perichoresis of the Holy Trinity. The carmelite mystic Saint John of the Cross sketched his vision of this perspective (from the head of the cross looking down upon those gathered at the foot) corresponding to the Father's love radiating down on the priest and congregation worshiping at the altar. 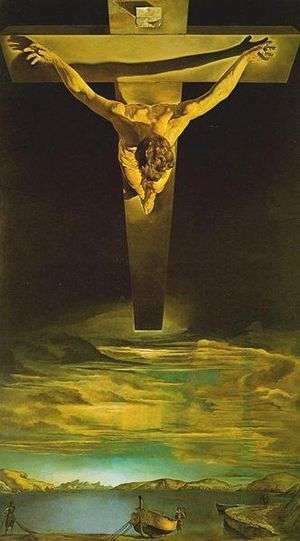 Salvador Dalí was inspired to paint his monumental work Christ of Saint John of the Cross after a spiritual crisis saw him revert to his childhood faith upon reading the classic Dark Night of the Soul. This arresting image calls to mind the waterfall martyrdom that opens Roland Joffés 1986 movie The Mission set in Iguazu Falls in the 1750s. The human soul transcends his mortal limitations by faith "in things hoped for, on evidence of thing not seen" (Hebrews 11:1)  a salvation of conformity in perichoresis leads to eternal life. Protestant and Catholics differ in their interpretation of communio as model of ecclesial unity binding on members of the Mystical body of Christ. A dyadically reduced trinitarianism underpins the Barthian school of thought. ― Aaron Riches, "Church, Eucharist, and Predestination in Barth and de Lubac: CONVERGENCE AND DIVERGENCE IN COMMUNIO" Communio 35 (Winter 2008). 1 2 3 4 Cross, F.L. ; Livingstone, E.A., eds. (1974). "Circumincession". The Oxford Dictionary of the Christian Church (2 ed.). Oxford: Oxford University Press. ↑ Online Latin lexicon, Lewis and Short Latin Dictionary at Perseus; entry for "incedo"
↑ Generation and Spiration: The Processions of the Trinity Thomas L McDonald of the Catholic Channel at Patheos.com "Hosting the Conversation on Faith"
↑ Location blog citation in "Idea of a University" chapter entitled "University Preaching"
DURAND, Emmanuel. La périchorèse des personnes divines : immanence mutuelle – réciprocité et communion, Paris: Cerf (Cogitation Fidei; 243), 2005, 409 p.
Lane G. Tipton, "The Function of Perichoresis and the Divine Incomprehensibility," Westminster Theological Journal, Fall 2002. David J. Engelsma, Trinity and Covenant, Reformed Free Publishing Association, 2006. Perichoresis website of Dr. C. Baxter Kruger "Sharing the Good News of our Adoption in Christ"